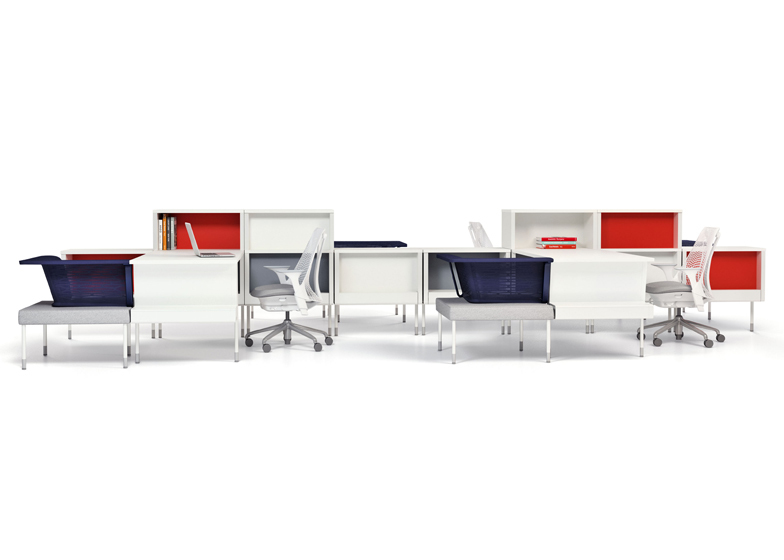 Product news: Yves Behar's San Francisco studio Fuseproject launches an office furniture system for American design brand Herman Miller at the Neocon trade fair in Chicago this week (+ slideshow). 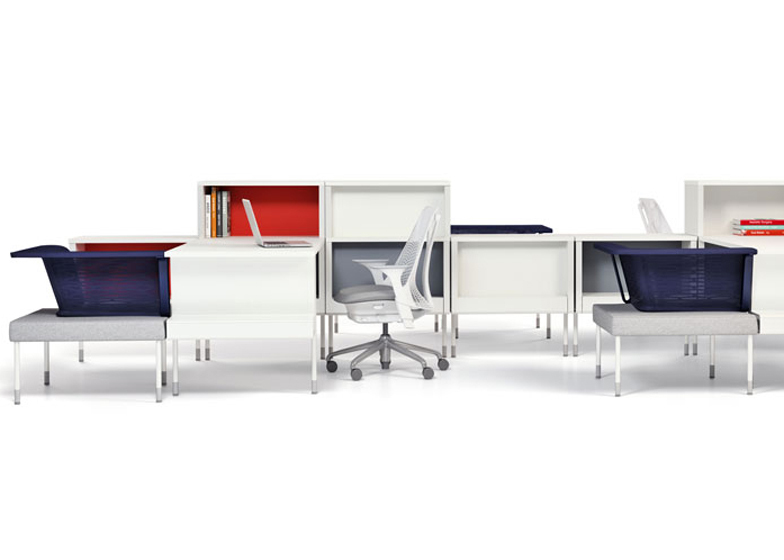 Called Public Office Landscape, the modular design by Fuseproject for Herman Miller aims to encourage spontaneous conversations and continuous collaboration between employees. 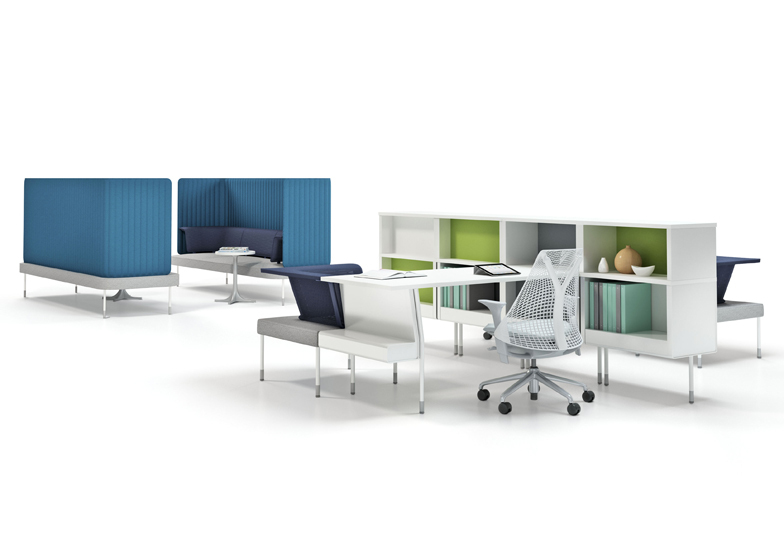 Rather than design desks for individuals interspersed with pockets of collaborative meeting areas, Behar wanted to spread collaboration evenly throughout the office. 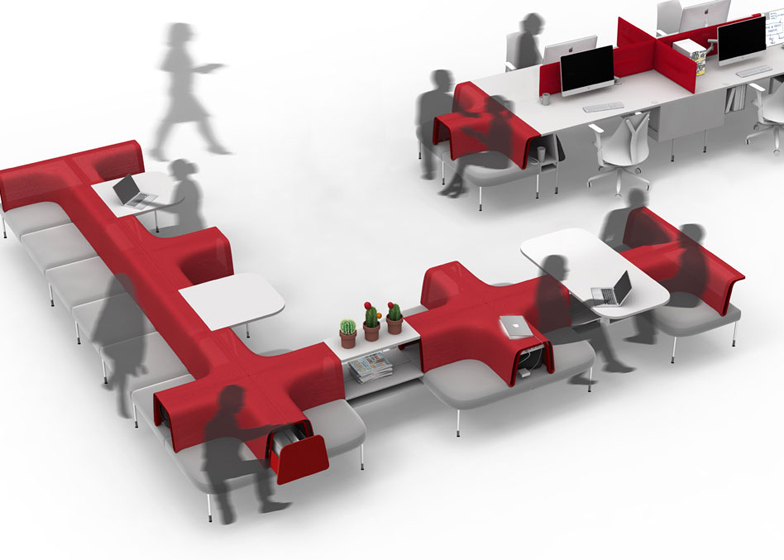 The designers came up with three main concepts: social desks for individuals to work in configurations that encourage interaction, group spaces for focussed collaboration and spaces in between that facilitate casual interactions and community. 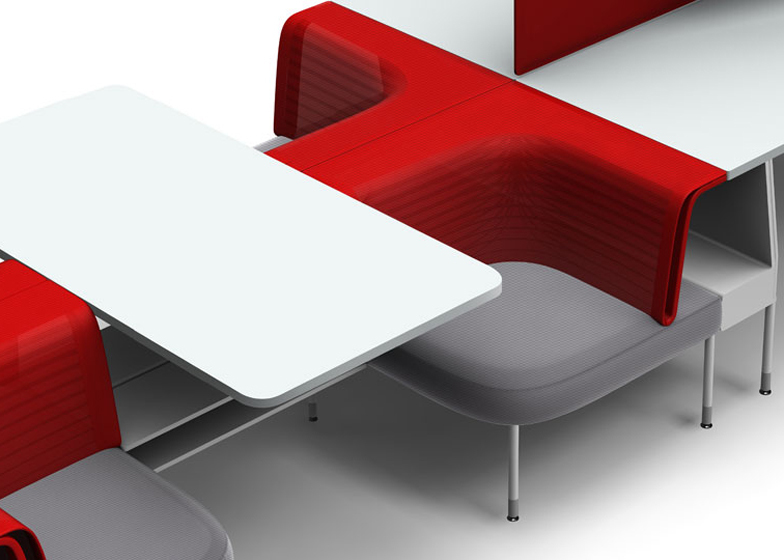 The resulting modular system features seating elements that flow into desks and soft fabrics that flow into hard surfaces. Fuseproject used the prototypes at their own office in San Francisco, testing and evolving the various elements in-situ over the course of 18 months. Neocon continues until 12 June. Yves Behar previously designed the Sayl office chair based on suspension bridges for Herman Miller. Other recent product launches by Behar include a lock with no keys and a remote control with no butons. Herman Miller recently acquired New York-based textile manufacturer Maharam in a deal worth about £101 million and will also present work by Industrial Facility this week, who the brand previously worked with on the Enchord two-tier work desk in 2008. In a recent Opinion column on Dezeen Sam Jacob called for an end to the "tyranny of fun" in office design, while Jean Nouvel told us than "apartments make better places to work than offices" in an interview about his office design installation at the Salone Internazionale del Mobile. 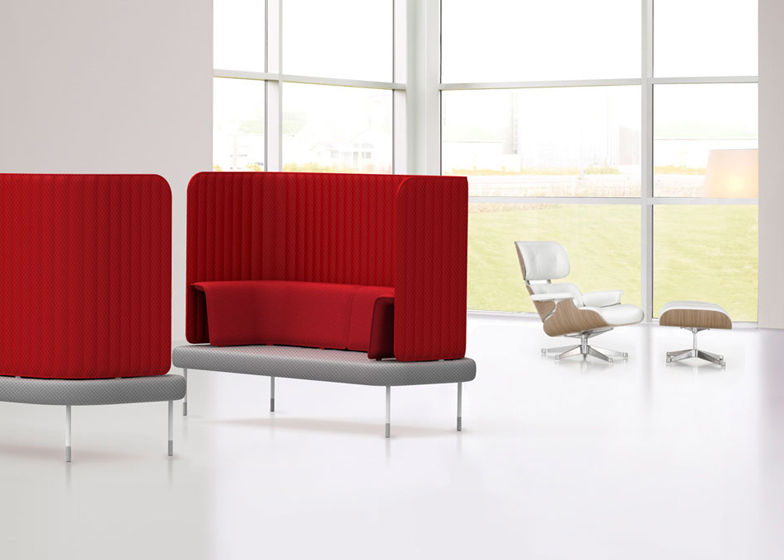 I began thinking about the need for casual, collaborative office seating three years ago, when I was in Cologne for the Orgatec furniture show. I was walking with Don Goeman — Herman Miller’s Executive Vice President of Research, Development, and Design — when he stopped to point out a couch with sectionals made from large blocks of foam. It seemed like the designer of the couch had thought to himself, “big chunks of foam say comfort!”. 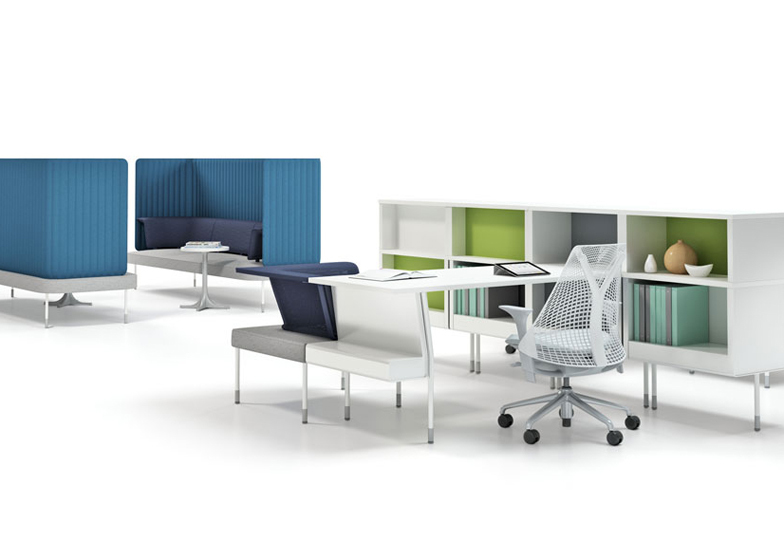 A year later, when Herman Miller asked me and my team at fuseproject to develop a more effective office environment for collaboration, I saw an opportunity to go beyond the superficial approach to social seating design I had observed a year earlier. I wanted to create a design that would support a more flexible, fluid way of working while addressing the very human need for interaction. With research showing that 70 percent of collaboration happens at a workstation, I saw a clear need for desks that support interaction. This led to our concept for Social Desking for individuals, Group spaces to allow collaboration in proximity, and Interstitial spaces which are solutions which convert spaces in between into community space for casual interactions — a set of ideas that would ultimately become Public Office Landscape. This system of shared surfaces would be inviting to guests, have no implied hierarchy, and offer collaborative zones spread evenly throughout the floor plan. The idea of integrated spaces for casual meetings went against the traditional thinking that individual and social work habits need to be separated. We believe collaboration doesn't just happen in conference rooms— it happens everywhere. 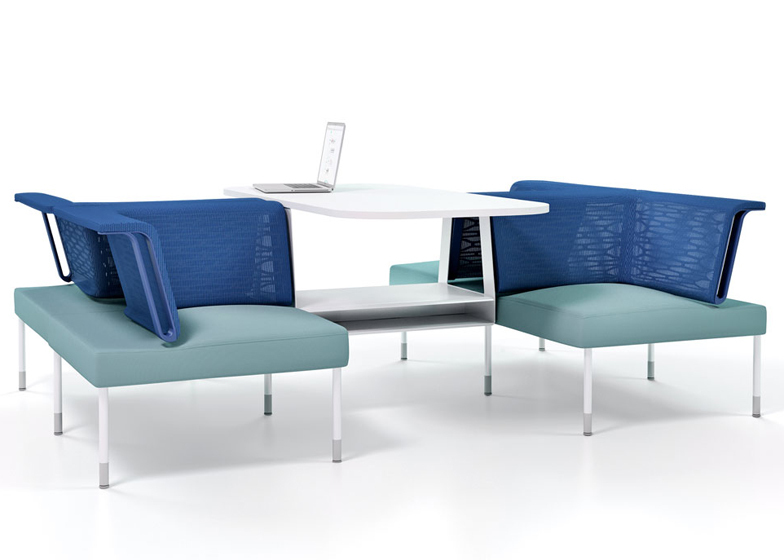 Public proposes collaborative areas in close proximity to individual workstations and addresses this disconnect and encourages the type of productive interaction that drives organizations forward. As we worked with Herman Miller to bring our vision for Public Office Landscape to life, we were able to test our ideas and prototypes at our new office in San Francisco. We injected ourselves into the design process and inhabited evolving versions of the furniture for 18 months — literally growing every part of the vast system, while researching and evaluating variations, and refining the design. 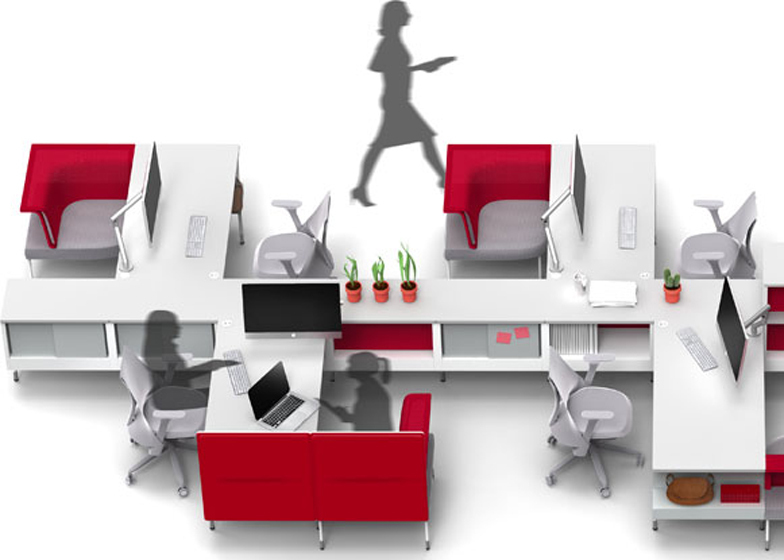 The result of our work is a system that achieves an ideal state of flow in the office. Public Office Landscape encourages fluid interactions and spontaneous conversations with seating elements that flow into desks, and with soft fabrics that flow into hard surfaces. These designs culminate in a choice of focused and collaborative places to work. All of this variety helps people feel engaged, focused, and free to move between tasks without interruption. With the support of elements like the Social Chair — the first of its kind to introduce ergonomics into collaborative seating — people can feel good while doing some of their best work. There is no technical reason why offices are needed today. In theory, we could all be working from home, remotely checking in when needed. The reason why people still want to go to an office, is to collaborate with others. Public Office Landscape offers a better way of working together with solutions that we believe will be increasingly relevant. Public addresses collaboration not in moments, but as movement. It is designed with collaboration spread evenly throughout the space, while the system’s modular components can evolve with the needs of groups and individuals. And with a variety of ergonomic and collaborative elements to enhance fluidity in the workplace, the system will continue to support the ways people want to work. Living Office is a different approach to managing people and their work, the tools and products that enable that work, and the places where people come together to do it. Together with Yves Behar’s fuseproject, Sam Hecht and Kim Colin, and Studio 7.5, Herman Miller is expanding its offering of human-centered elements to create a total work experience that is more natural and desirable, and within it the opportunity for individuals and organisations to achieve a new dynamic of shared prosperity. Built on what is fundamental to all humans, Living Office will help both people and their organizations to update their places, tools, and the management of the workplace, to uniquely express and enable shared character and purpose.